Ideal for gift giving, three bags in different colors are each designed to hold a bottle of wine. 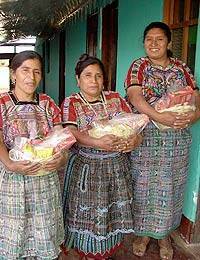 They highlight the versatile artistry of Guatemala textiles. Woven on a traditional handloom by Women of the Yama Aj Chixot Artisan Group, the bags close with cotton drawstrings.